Castleford secured a Super League semi-final spot as they eased past injury-hit Hull FC at the KCOM Stadium. Mike McMeeken went over to put Tigers ahead, before Junior Moors powered over for the visitors' second try. Greg Eden ran in their third from 90 metres out after intercepting a pass off team-mate Michael Shenton's head. Tries from Eden and James Clare further extended the lead, before Carlos Tuimavave and Hakim Miloudi crossed to restore some pride for the hosts. 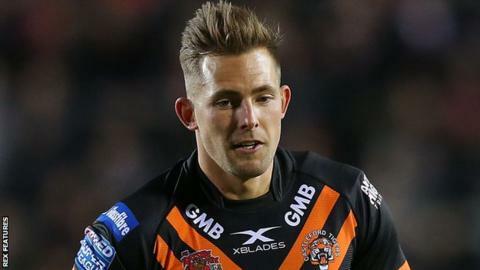 Hull, missing eight first-team players, were outclassed for a second week running, having lost 80-10 to Warrington in their previous game. But they were somewhat unlucky to trail by 18 points at the break, with McMeeken's try coming after a fortunate deflection from Jacob Trueman's grubber-kick and Eden's score ending a brief period of pressure from Hull. The hosts improved after Clare's effort had put the result beyond doubt, and Miloudi produced arguably the pick of the tries when he cut off another Trueman kick before racing 90 metres to score. But they were unable to produce a fightback, as Castleford claimed a third successive victory. "I was genuinely worried with regards to the response [to the Warrington defeat] from some of them, because I've never seen some of them so low. "But I'm really, really pleased with the response from the group." Hull FC: Shaul; Faraimo, Tuimavave, Scott, Talanoa; Miloudi, Harris; Taylor, Houghton, Matongo, Washbrook, Manu, Hadley. Replacements: Fash, Bienek, Lane, Litten. Castleford: Mata'utia; Clare, Wardle, Shenton, Eden; Trueman, Gale; Watts, McShane, Millington, Holmes, McMeeken, Massey. Replacements: Roberts, Moors, Milner, Clark.